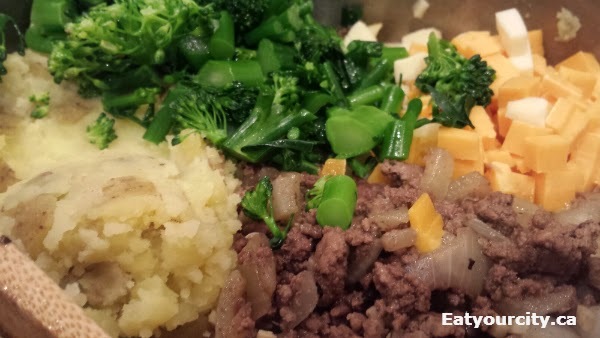 Eat Your City: Lazy Sheppard's pie recipe, Shepards? or Sheppards? whatever, its tasty and easy! Lazy Sheppard's pie recipe, Shepards? or Sheppards? whatever, its tasty and easy! Posted by However you spell it, Sheppard's pie is a homestyl comforting dish that brings back childhood memories. While its usually layers of seasoned ground meat, maybe some vegetables and topped with mashed potatoes +/- butter and cheese and herbs and +/- smothering it in a lot of gravy. Like the classic mac and cheese, there's a bazillion versions of Sheppard's pie out there, and I'll be adding mine to the lot with this lazy version my mom used to make. -6-8 medium potatoes, washed, peeled or not and sliced into 1/2 inch "coins"
1) Mix as many seasonings as you like into the ground meat and set aside. In a pot that can hold the potatoes (pot should be half full), fill the rest of the pot up 3/4 way with water and set to boil. Simmer potatoes for 10min or until they are soft when poked with a fork. Drain. 2) Meanwhile, wash, dice and prep all your vegetables. 3) Heat up a large deep pan or skillet with the oil on medium high heat. Brown the seasoned ground beef mixture stirring occasionally until all the meat is thoroughly cooked, about 10 minutes. Dump into a clean container or bowl. 5) Mash the drained and cooked potatoes. Add in optional cheese if you like. Season to taste.